In this present climate of revival and ongoing musical reminiscence of metal antiquity, a curious question tends to present itself regarding what constitutes modernity, and by extension, what is the modern ideal? While not an outright requirement of modern metal in the recent past, there has been a tendency towards putting great distance between the early days of metal and the present, sometimes to the point of outright eschewing some of the more noteworthy past feats of greatness in the heavy metal scene of the 1980s. It could be stipulated that the respective power, thrash and early heavy metal revivals that have taken place since the late 1990s represent a reaction against this trend, often to the point of visiting the same implicit hostility to latter day metal practices. 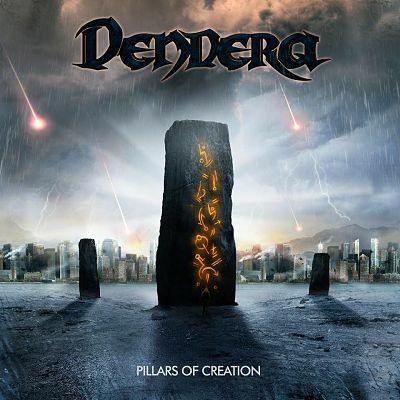 For those who have tended towards a more eclectic outlook on metal music and don’t necessarily see a need for such stringent divisions, there are a few exciting new bands that have attempted to bridge the divide, and Dendera is among the more competent of said crop. At first glance, this band of freshmen British metal maniacs would give the appearance of something entirely different than their chosen style, particularly given the album art of their sophomore effort Pillars Of Creation, which adopts an aesthetic right out of the Nevermore playbook while also somewhat resembling the popular Dead Space game series that is a favorite inspiration for slam and brutal acts of the past five or six years. In truth, when approaching the heavy ended and dark production quality that their music exhibits, the Nevermore comparison has some degree of applicability musically, though their guitar work is definitely titled far closer to the melodic tinge of Iron Maiden and vocalist Ashley Edison has more of a classic heavy metal quality to his high-end wails and occasionally dirty shouts. In short, this band could be best described as an old school heavy metal band born into a modern, Dystopian world where their archaic musical language is instantly translated into something more easily identified by contemporary listeners. The stylistic label of heavy metal is probably the best one to slap onto the eight ambitious compositions that round out this impressive album, but it should naturally come with a few caveats. The overall structure and development of catchy yet thick and grooving crushers like “Disillusioned” and “Bloodlust” definitely have a fair bit of Iron Maiden melodic guitar and vocal hooks and an upbeat, Judas Priest brand of speed metal influence to them, but are painted over with a dark gloss that puts them a bit closer to the more recent outings of each band’s respective front man’s solo outings, particularly Dickinson’sThe Chemical Wedding and Halford’s Resurrection. Contrasting this tendency is “In High Tide” which rests somewhere closer to an early 90s Megadeth mode of mid-paced thrashing, and an even darker and meatier variation on the same take that occasionally flirts with the past few Nevermore albums occurs on the progressive epic closer “Edge Of Tomorow”, minus the liability of Warrel Dane’s shoddy vocals in favor of something more triumphant. But the greatest thing of all about an album such as this fine one is the dual approach of providing a catchy, recurring set of hooks while still keeping things nuanced and fresh. It’s the sort of album that lends itself to being sung along with in short order while also avoiding any staleness or redundancy when repeated listens bear down on it. It is definitely a distinct feat of modern aggression and progression that stands out among a still sizable number of bands that still think that the likes of Machine Head and Pantera are the final word on where metal goes when it leaves the bounds of the old school sound. It’s a well rounded, varied collection of nods to a fairly sizable spectrum of older and newer bands and albums that result in something new, fresh, and most assuredly worthy of a greater audience. This entry was posted in Reviews and tagged dark, Dendera, Heavy Metal, iron maiden, Pillars Of Creation, Thrash Metal Influences, united kingdom.